I was invited to share a devotional recently at an “Anne of Green Gables” themed baby shower. The guests of honor were a sweet friend and her newly-adopted and long-awaited baby girl. Anne was adopted too, so it was a fitting theme for a very special celebration. 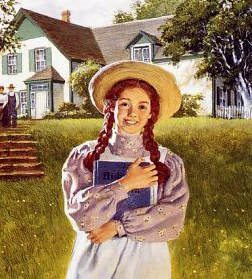 Most of you are probably familiar with Lucy Maud Montgomery’s precocious and charming character, “Anne-with-an-‘e’.” My former roommate Kim was obsessed with her. Years later I, too, became enchanted as my two oldest daughters and I read the books which chronicled her adventures together. And while Anne had a penchant for creating mischief, she also possessed a wisdom beyond her years. When you become a parent, your time is no longer your own. You can’t even go to the bathroom by yourself! As a new mom I especially missed my long, uninterrupted times with God. Often I’d be too tired to even focus my scattered thoughts into prayers. I used to beat myself up for this. Here’s what I would tell that mama now: God knows. Give yourself grace. He does. I was inspired by Gigi Graham Tchividjian’s habit of leaving her Bible open on the ironing board, so she could read or meditate on a verse or two as she went about her busy day. There are many creative ways to relate to God. And He is always closer than a prayer. I remember cuddling my own perfect newborn baby girl and determining to be the perfect mom for her. And then there was that day I was visiting a friend at the hospital and literally FORGOT that I had a nursing baby at home! Upon my return, I was greeted at the door by a frazzled husband and a famished child! Oops. Major mom fail. Mistakes will be made. Thankfully kids (and usually husbands) are very forgiving. So is God. I believe the secret to contentment as a parent is to enjoy what is good in each season. If you focus on what is difficult, you’ll miss what is delightful. If you lament the things you’ve lost or fret about the future, you’ll miss the gifts you’ve been given. I absolutely dreaded the teen years. And while teens can be challenging, they are also a ton of FUN! I have experienced great joy in watching each of our daughters develop into beautiful young women. Look for the good. It’s there. Two decades ago we packed up our two-bedroom apartment and a five-month-old baby and moved “across the pond” to jolly old England. Where we didn’t know One. Single. Soul. Suddenly I didn’t feel so jolly. Wherever we go, we need kindred spirits–those friends of the heart who just “get” us. Soon after settling into our quaint little English village, God graciously answered my prayers for such a friend through Caroline, herself a new British mum. Through the years there have been others who have come along just when I needed the encouragement of a fellow mom. I currently meet once a week with some dear kindred spirits to pray for our children. Parenthood is best played as a team sport. Don’t go it alone. Your kindred spirits are out there too, just waiting to be found. I used to hate it when older moms or random strangers would say that to me when my kids were young. Because I wanted to hold onto my babies forever. And I knew I couldn’t. There is an inherent vulnerability that comes with having and loving a child. It can be hard on the heart. But nothing has taught me more about selfless, sacrificial love than being a mom. It has stretched me and called out the best in me. It has taught me to love like God loves. Parenting will take all you’ve got. And then some. But love is always worth the cost. Whether you’re a new parent just embarking on your journey, or one who’s logged some parenting miles, take heart. There is help and wisdom to guide you along the way. Sometimes it may come from a surprising source, like a former orphan girl named Anne. But always, always, it is readily available from your ever-present and never-failing Heavenly Father.